YOU CAN MAKE OUR COMMUNITY STRONGER! EVERY VEHICLE PURCHASED WILL HELP US CREATE AN ADDITIONAL MENTORSHIP IN OUR COMMUNITY! 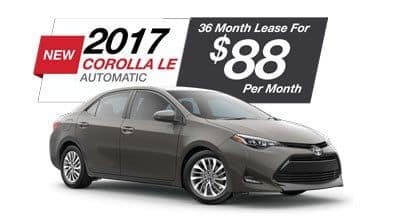 2017 Toyota Corolla LE Model 1852. 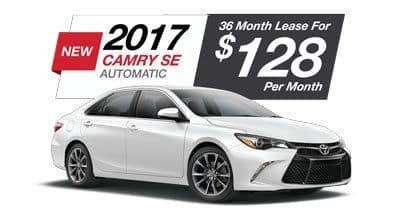 Lease for $88 per month for 36 months on select models. $4,688 due at signing. Total due at signing includes down payment, first months payment, and acquisition fee. $15,318 adjusted capitalized cost. No security deposit required. With approved credit through SETF. Plus tax, tag, title, and $899 dealer fee. 2017 Toyota Camry SE Model 2546. Lease for $128 per month for 36 months on select models. $4,588 due at signing. Total due at signing includes down payment, first months payment, and acquisition fee. $18,995 adjusted capitalized cost. No security deposit required. With approved credit through SETF. Plus tax, tag, title, and $899 dealer fee. 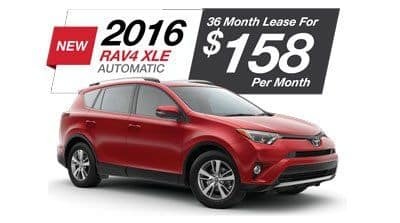 2016 Toyota RAV4 XLE Model 4440. Lease for $158 per month for 36 months on select models. $4,488 due at signing. Total due at signing includes down payment, first months payment, and acquisition fee. $23,682 adjusted capitalized cost. No security deposit required. With approved credit through SETF. Plus tax, tag, title, and $899 dealer fee. See dealer for details. Excludes first payment, tax, tag, title, registration, and fees. Capitalized cost $23,562. For qualified buyers with 740+ Equifax beacon score qualifier. 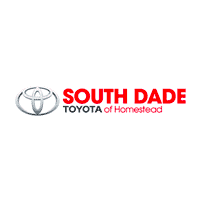 0.0% with respective terms of 60/72 months offers apply to well-qualified buyers and require approved credit and financing through Southeast Toyota Finance. Payments for the first 90 days are deferred. Monthly payment for every $1,000 financed on 60 months = $16.67; on 72 months = $13.89. No down payment required. May not be combined with any other offers except this Special APR Financing offer. Excludes tax, tag, registration, title and dealer fees. Offer ends 2/28/2017. 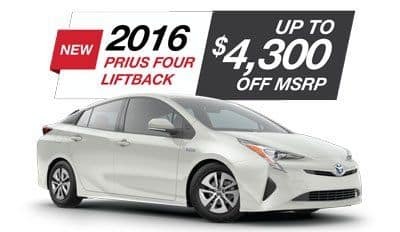 New 2016 Toyota Prius Four Liftback (Model 1227) stk#515709 MSRP $30,937 Sale Price $26,558. Sales price includes $3,000 manufacturer to dealer incentive. Cannot be combined with APR or Lease Specials. $1,300 OFF MSRP provided by dealer. Excudes $899 Dealer Fee. Excludes tax, tag, title and license. Offer ends 02/28/2017. 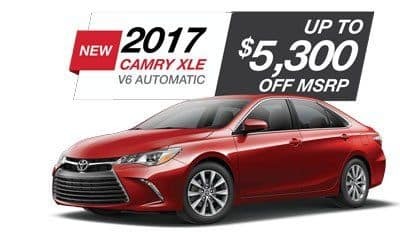 New 2017 Toyota Camry XLE V6 Liftback (Model 2554) stk#577431 MSRP $35,131 Sale Price $29,806. Sales price includes $3,000 manufacturer to dealer incentive. Cannot be combined with APR or Lease Specials. $2,300 OFF MSRP provided by dealer. Excludes $899 Dealer Fee. Excludes tax, tag, title and license. Offer ends 02/28/2017. CREDIT PROBLEMS? WE CAN HELP. APPLY NOW! *If the number printed next to your name in the address panel of this mailer matches exactly to the winning number on the prize board at the sales event, February 23 – February 28, 2017, then you win the prize that matches your number. The symbol you scratched off does not give you a choice, but an opportunity to win a prize. Odds of winning Grand Prize of a New 2017 Toyota Camry SE (valued at $25,000) 1:500,000. Odds of winning $5,000 Kitchen Makeover 1:500,000. Odds of winning $2,500 Couples Vacation 1:500,000. Odds of winning Macbook Pro worth $1,500 1:500,000. Odds of winning $399 PlayStation 4 and $599 50” Flat Screen LED TV 1:500,000. Odds of winning up to $500 (additional guaranteed prizes per every 2,000 invited guests that attend event: 160 $10 winners, 80 $20 winners, 40 $50 winners, 20 $100 winners, 2 $500 winners) 1:1. While supplies last. Maximum of one prize per household. Void where prohibited. Dealer and/or event coordinator, and advertising agency are not responsible for lost, late, copied or misdirected prize piece. Pictures may not resemble exact prize models. We reserve the right to correct any errors that appear in this invitation. Due to advertising deadlines not all offers may be available. All offers end February 28, 2017.